After six consecutive years of growth, UK marketing budgets have finally stalled in the final quarter of 2018, according the latest IPA Bellwether report. The report is based on data from a panel of 300 marketers selected from the top 1,000 UK companies and provides marketing spend sentiment data. Although there is evidence some marketers still feel some level of optimism for 2019, Brexit chaos has dampened both business and consumer confidence, driving down budgets and restricting marketing resources. 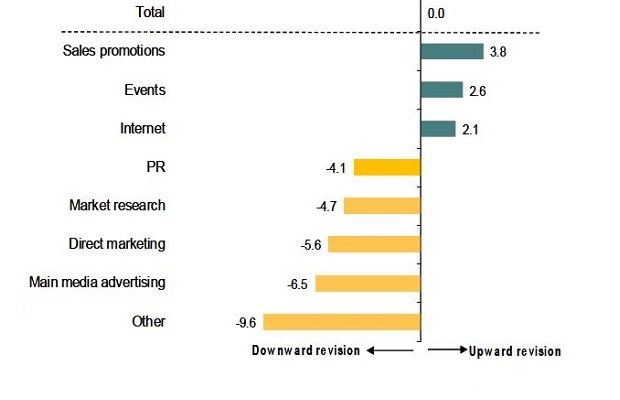 Overall, marketing budgets remained flat in Q4, with spend in mainstream media advertising (down 6.5 per cent on Q3), direct marketing (down 5.6 per cent), market research (down 4.7 per cent) and PR (down 4.1 per cent) feeling the brunt of the spending squeeze. Even the budgets for digital performance marketing, such as search and SEO, dropped 3.9 per cent, marking the first time it has been cut since 2009. Spend in another growing category, mobile advertising, also fell by 2.4 per cent. Internet advertising overall grew by only 2.1 per cent, which highlights a huge softening of investment in digital media, which had grown by 13.6 per cent in Q3. The major winner in Q4 is sales promotions, with budgets in this category up 3.6 per cent. Revised predictions for 2018 ad spend have now been revised down from 1.1 per cent to 0.5 per cent, but the report predicts 2019 could see a larger rebound than previously expected. Brexit and political uncertainty is being blamed for tighter purse strings and a gloomy outlook, with respondents to the study pessimistic about their company’s prospects for the first time in six years. "In uncertain political and economic times such as these, the understandable reaction for some advertisers is to lose confidence in brand-building advertising and to think short term, even to the point of heavily discounting their products and services," IPA director general Paul Bainsfair said. "We’ve seen this online and offline in the run up to Christmas – and now see the impact in black and white in this latest Bellwether Report." Julia Smith, Director of Communications, Impact EMEA, said: "The latest IPA Bellwether report heralds the news that, in Q4 2018, marketing budget growth ceased, after a six-year consecutive run. It is understandable that there has been a negative effect on spend given the fragility of the economy in the wake of a looming Brexit decision, with the report also predicting muted growth in 2019 in light of the ongoing and uncertain Brexit negotiations. "There are going to be challenging times ahead and brands will be more focused on their own corporate challenges and shareholder pressures; rather than on their marketing spends. However, marketers will invest in digital advertising and reap the benefits of a performance driven sector that continues to deliver strong results. This is going to be driven by the fact that consumers are immersing themselves more than ever in their screens. It has therefore never been a more effective time to generate accountable results across video, mobile and display. "Of course, there is still the white elephant in the room of a potential second referendum on Brexit and it remains to be seen to what extent this will affect the flow of marketing spend into digital advertising in 2019."